Healthcare services are usually associated with hospitals and clinics, but health issues go beyond what happens in institutional settings and are deeply impacted by urban and building design. Disease prevention, health promotion and caring can be embedded in the very building fabric. In keeping with the main UIA Congress sub-themes of RESILIENCE, ECOLOGY and VALUES, the UIA Public Health Group invites you to participate in an ideas competition, called HEALTHCARE OTHERWHERE. This calls for architectural interventions along the roads surrounding the bustling inner-city hub of Warwick Junction which are aimed at promoting health and well-being, and averting disease. Intrigued? 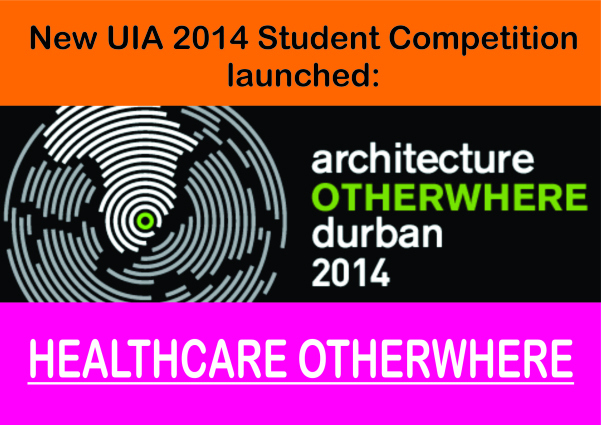 Visit www.uia2014durban.org to find out more about the competition and how you can register and participate in PHG activities at UIA 2014 Durban. Please pass on to students, schools of architecture, and related disciplines - it promises to be loads of fun. Registrations close 31st March 2014.